provided by Samsung well this is good news for the people of Nepal. The reach of smart phones is now not so difficult. Any middle class family can afford it but the most interesting thing is now you can earn from smart phones. Yes, I am telling the right thing now you can have some extra income from your smart phones in Nepal. This technology is particularly made by Nepalese and you can really earn from it and the name of the technology is CashOnAd. This particular technology is called video media advertisement. How does it work so that you can earn money in Nepal? Well this is very simple just you need to download CashOnAd app form the app stores it is available for android and iphones. After you download it you need to create account or sign in with facebook. Then allow the video Ads to be downloaded which is automatic. These videos are in .mp4 format and occupy less than 1Mb space. When everything is fine then whenever you receive a call then this video ads are played just you need to do is watch the videos for 6 sec and only receive the call if you do not receive the call after watching for 6 sec then you are not going to earn. Anyone with the smart phone can participate in this campaign and you need not pay anything in return. The minimum payout is of $1 and you can withdraw the amount in Nepal with the esewa. So this can be the good way of earning and I have also personally used it and found it bit good but I recommend you to turn off the service while using packet data because it will automatically download Video ads and your money will be deducted unexpectedly and after turning off the packet data do not forget to turn on the CashOnAd. Similarly use wifi to download the Video ads and this will be quite effective. CashOnAd has really made a new revolution in online earning sector. 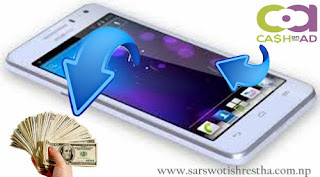 You can earn in Nepal online with Smartphone. You can make money online in Nepal with CashOnAd and this is really a nice way to earn something. So test it. Yes CashOnAd is really a nice way to earn online in Nepal I have used it and believe me I made $8 well this is small amount but better than nothing so try it. Well nice post keep on posting more. CashOnAd is not so good because it pays off small amount but for beginners it can be a small kick off. Really nice post and I hope this post can make my wallet bit thick. Really nice job keep on posting such good piece and also write about the ways to earn online in Nepal with website.